The Australian Plants Society Tasmania Inc. (formerly the Society for Growing Australian Plants) is part of an Australia-wide organisation made up of people interested in the propagation, cultivation and conservation of plants native to Australia – our group represents the Australian Plants Society in Northern Tasmania. There are also Tasmanian groups in Hobart and the North West Coast. The Society for Growing Australian Plants SGAP was founded by Mr A J Swaby in Melbourne in 1957. For several years he wrote a column Know Your Natives in the popular gardening magazine “Your Garden”. These articles attracted a great deal of interest. The slogan he used was “Australians for Australia”, and he realised the progress which could be made towards this end by growers helping one another through a chain of interested people across the continent. “Regions” were set up in a number of states and Tasmania became part of the South East Region, with headquarters in Melbourne. In May 1971 the Tasmanian Region was formed, led by Kay Geeves and based in Hobart. Other local groups were subsequently formed and are active throughout the state. 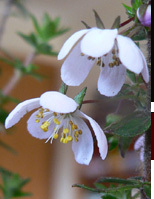 In March 1999 the Society changed its name to the Australian Plants Society Tasmania Inc. in line with similar name changes in mainland groups. Monthly meetings are held on the THIRD Tuesday of each month and we meet at the Max Fry Hall, Gorge Road, Trevallyn at 7.30PM. New members are always welcome.